If you’re contemplating applying to be a Maker at Brighton Mini Maker Faire 2012, but are not sure what to expect, here’s the lowdown from one of last year’s Makers, Jay Kendall. We’ll be featuring different Makers from last year’s event over the next few weeks to give you a flavour for what to expect if you’re thinking of coming this year. Don’t forget you have until 20th June to apply. Never having done a Maker Faire before, I was unprepared for what unravelled throughout the day. Having organised all my supplies, a spare pair of hands, a bed for the night before so I wouldn’t be late, and the bus timetable for the same reason, I was in theory prepared. I arrived early, found my space and set everything up. There were lots of volunteers to assist and so many exhibitors I was rather overwhelmed by the scale of what the fair was offering to the public. I was having second thoughts, technology was all around me, helicopters flying, moving images and stuff I couldn’t begin to describe. What was I doing there? 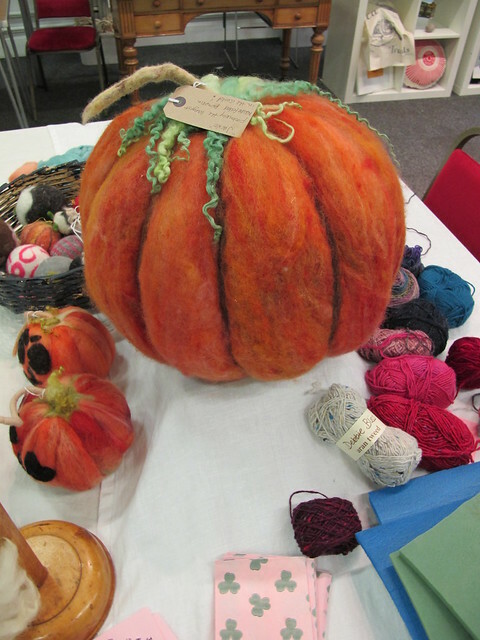 I work with wool and was going to demonstrate how to make felt balls, no technology, no laptop, no electricity, no robotics – just wool and a needle. The rooms began to fill up and my helper made it in the nick of time. A very quick tutorial and a health and safety talk later, and we were surrounded by eager hands wanting to make a ball. From that moment on we didn’t stop talking and demonstrating. Sit down, health and safety talk, wool, needle, this is how you do it. So many times it was impossible to keep track. Again and again and again. A friend of a friend fetched coffee and by the time my helper broke free to find refreshments all that was left was cake. I managed to escape for 10 mins to cross the road and eat my lunch before elbowing my way back in to continue as before. Children as young as three enjoyed making a ball; boys, girls, mums, dads and grans all queued patiently and watched how it was done until it was their turn. The room was a buzz with excitement and the noise level was tremendous, but at our tables there was quiet chatter as everyone concentrated on what they were doing, knowing that if they took their eyes off the project they may stab themselves. I left the Corn Exchange feeling so exhausted it was as if I’d run a marathon. Would I do it again? You bet! Our open evenings are the time to come along and see what we are all about.